The idea for this project stemmed from adding three square posts to the lathes faceplate one of which had a clamping jaw as those seen later Photograph 1. 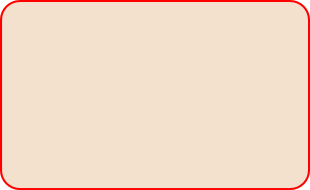 The idea was to use it as an alternative to the Keates angle plate. However, it was difficult to set the workpiece to the position required there being three posts to adjust. I largely overcame this by using four posts enabling the workpiece to be set one axis at a time. This worked much better but the clamping force available bowed the faceplate causing the jaw faces to splay a little at the outer ends. I considered though that this could be the basis of a design if using a much more substantial face plate and from these findings the subject for this project was developed. This being seen in Photograph 2. 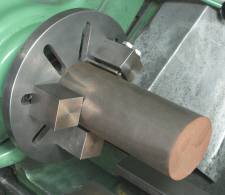 The drawings I have included suit a Myford series seven or any other similar size machine having a threaded mandrel nose, but in this case changes are likely to suit the lathe's mandrel. 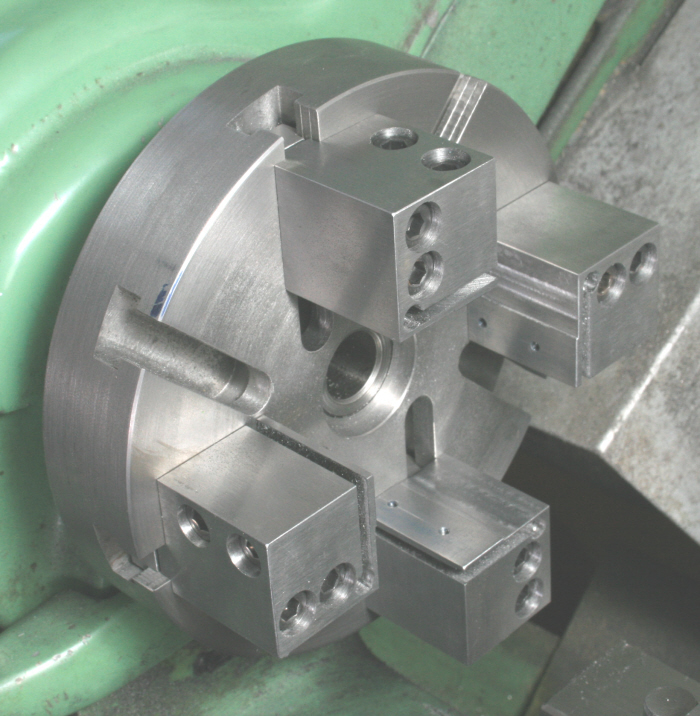 The design though is so simple that it should be easily adaptable for both smaller and larger lathes, also, for lathes having a flange mounting arrangement for its chucks, etc.. Some, who may likely use a four jaw only very occasionally, may even make one in place of purchasing a commercial chuck. This is made from a piece of 150mm diameter cast iron bar which I chose in favour of mild steel as it would be easier, if dirty, to machine the tee slots using my home made silver steel tee slot cutter having done this a number of times previously, I did though eventually use a purchased cutter. Drill and tap four M6 holes on a 100mm PCD and use these to secure the material to the lathe's existing faceplate, do though check these dimensions against your faceplate before proceeding. Also, ensure that the face is reasonably flat though in the case of a very small error the faceplate itself will distort, not the material with this being much thicker. However, if the error is substantial then machine it flat on the milling machine, though as the material will have been sawn from a bar such an error is unlikely. 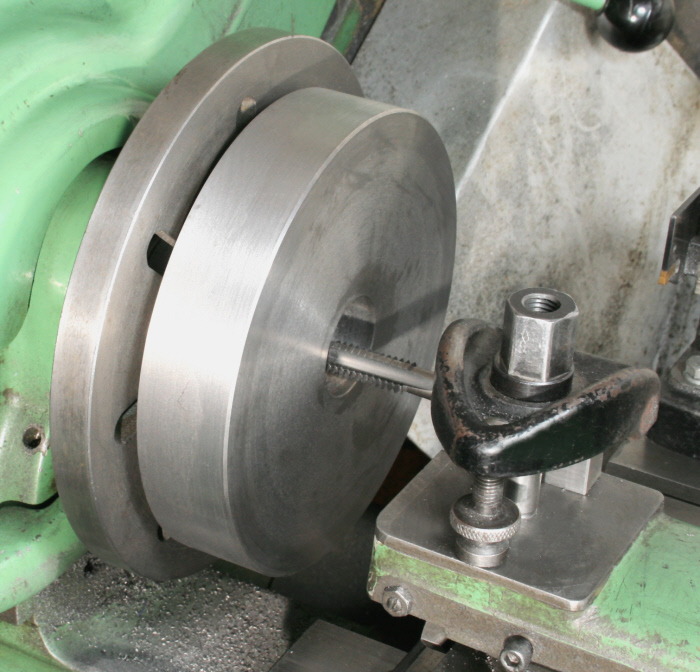 When mounting the material on the faceplate space it off with thick washers, say 5mm minimum, as this will permit the boring and thread cutting tools to break into the gap, Photograph 3.